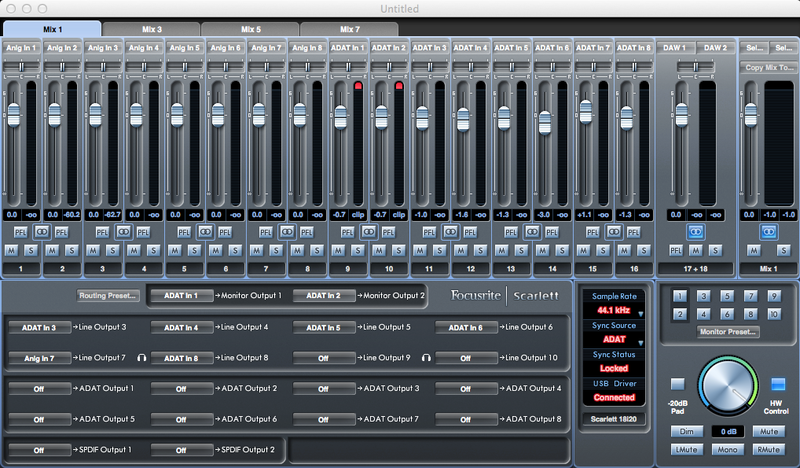 Whilst it is not possible to utilise two Scarlett USB devices together on the same computer, it is possible to use an 18i20 in standalone mode, and connect it via ADAT to an interface that has an ADAT in port. Below is an example of the settings needed for using in conjuntion with another 18i20, this allows us to look at signal run both to and from your computer, using both the inputs and outputs of your standalone unit. The below instructions can also be used for the Saffire Pro40 and the Saffire Liquid Saffire 56. 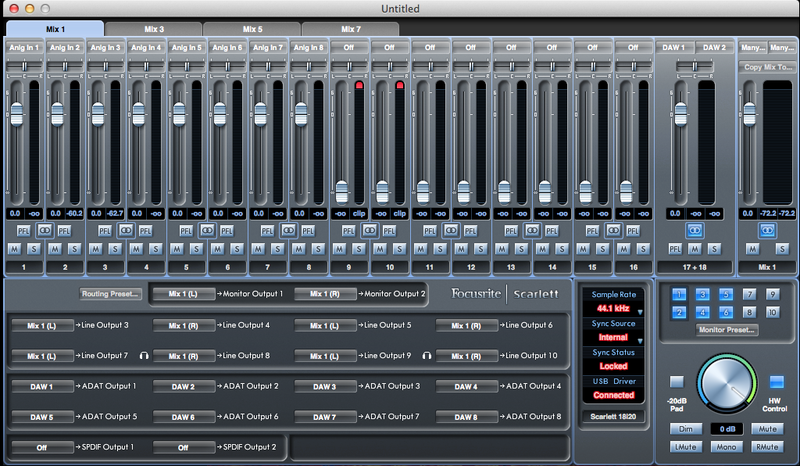 Plug in the unit to be used in standalone to your computer and open Mix Control. Set the sample rate to match the session as needed. Set the Sync Source to Internal. 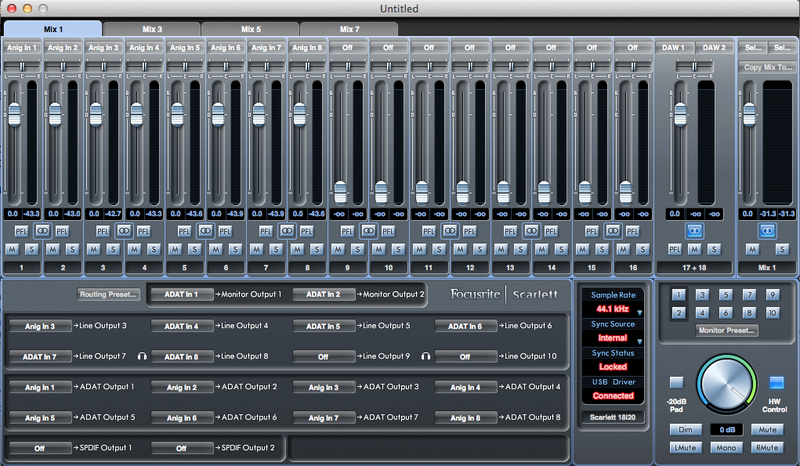 Output settings other than the ADAT Outputs do not matter at this point, as the unit is only being used for INPUT. Then disconnect this 18i20, connect the ADAT cable from it’s ADAT output to the ADAT input of the second 18i20, which you can now connect to the computer. 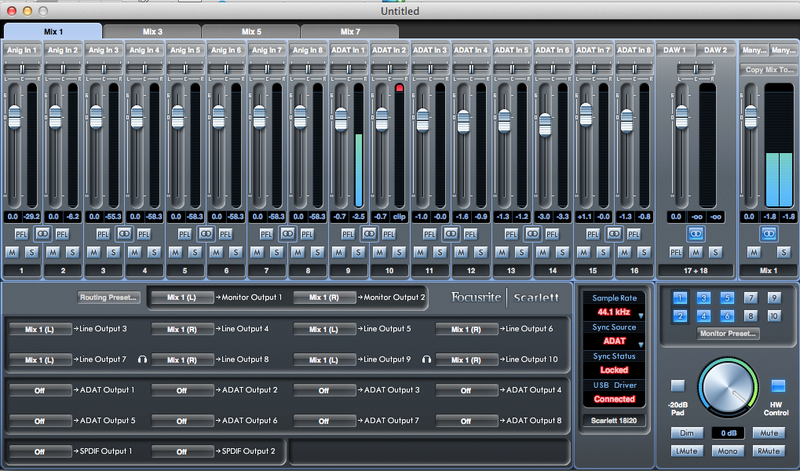 Open Mix Control & set the newly connected 18i20s samplerate to the same as the session and the standalone unit. Set this 18i20 sync source to ADAT. This now effectively increases your Input channel count to 16 analogue inputs. 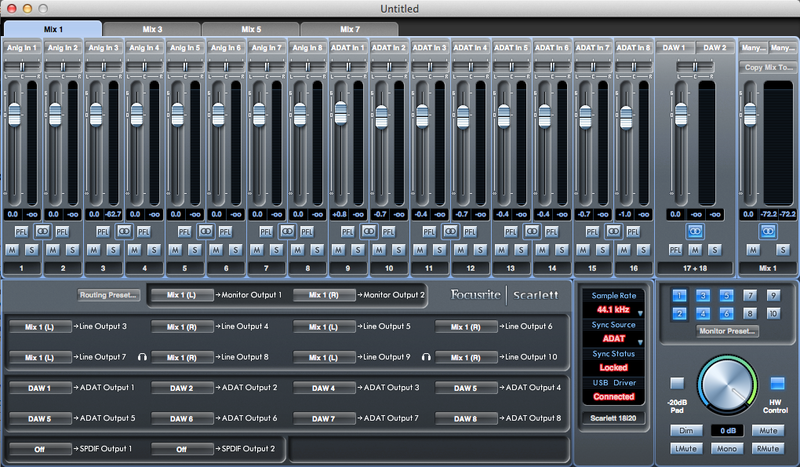 Set samplerate to the session. Ensure that all outputs on the right hand side are set to full scale (grey). To do this hold shift on keyboard and click each output. Close Mix Control and disconnect the 18i20. Connect your ADAT cable from the ADAT In of the Standalone unit to the ADAT Out of the 18i20 that is to be used with the computer. 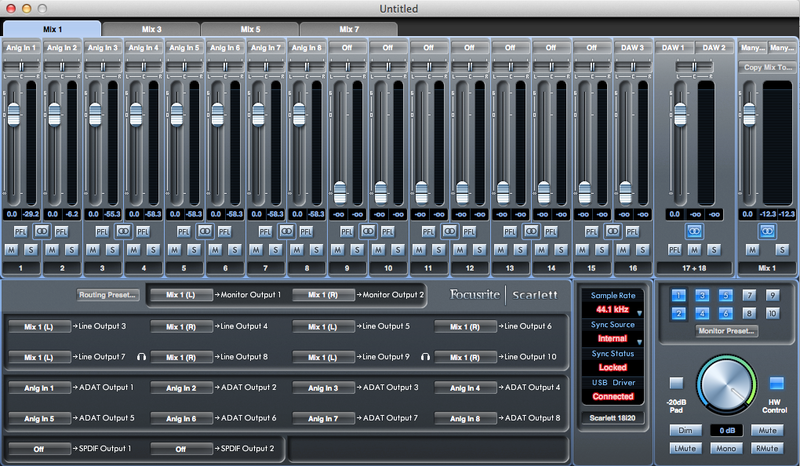 This now means you have 16 analogue outputs in your setup. You can of course utilise both setups at the same time, connect an ADAT cable to the ADAT inputs & outputs of BOTH units, and use both the inputs and outputs, a combination of the above. In this setup, it doesn't matter which unit is set to Sync Source Internal, and which to ADAT. THis is because ADAT cables are connected both ways, and so either unit can provide clock. Once the above is 'saved to hardware', again disconnect, connect your ADAT cables between the two units ADAT in & Out. There are of course many other combinations to be used, as well as the SPDIF in/out that you can utilise.